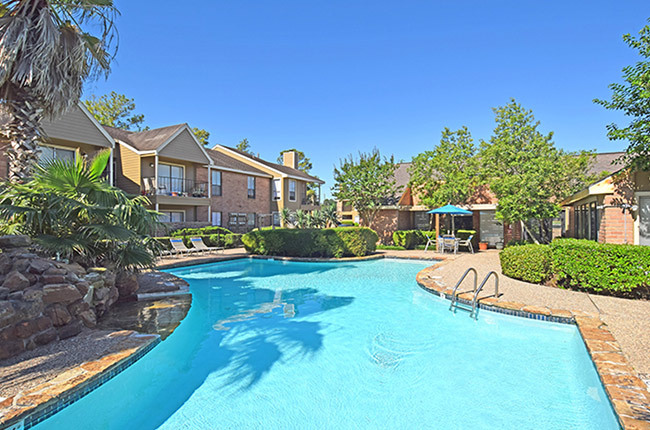 Experience the finest apartments in Houston, Texas at Westmount at Summer Cove Apartment Homes. Our inviting community combines the tranquil beauty of our lush, green surroundings with the contemporary elegance of our enriching suite of amenities. Discover all of the comforts of home, available in our generous selection of one and two-bedroom floor plans, which boast unique accents such as vaulted ceilings, spacious walk-in closets, and plush carpeting throughout. Our community amenities exude the pinnacle of luxury living with our state-of-the-art fitness center, picnic areas with grilling stations, and three resort-style swimming pools where you can swim, sunbathe, and socialize with your neighbors. Come home to the peace-of-mind you deserve at Westmount at Summer Cove Apartment Homes, the premier apartment community in South Houston. Nestled in a serene, residential neighborhood, Westmount at Summer Cove Apartment Homes boasts all the comforts of modern living within an enchanting wooded setting. The nearby scenic spaces of Sylvan Rodriguez Park provide a variety of walking and hiking trails for nature-lovers to explore, and the Bay Oaks Country Club offers a first-class course to enjoy on a sunny weekend day with a few close pals. Just down the road from our tranquil community, you can shop until you drop at Baybrook Mall, which offers Walmart and Target, in addition Zara, H&M, and Apple Store. If you’re looking for some urban culture, your new apartment home’s prime location makes any trip into Downtown Houston an effortless affair. You can easily visit the Museum of Fine Arts, the Houston Zoo, and Hermann Park at your leisure. Find everything you're looking for right here at Summer Cove! Map of Houston, TX which includes a marker with additional information about Westmount at Summer Cove. The address is 725 FM 1959 Houston, TX 77034.